One genre of media that I almost always adore is the heist genre. I love heist films and whenever there is a new TV series in the genre (unfortunately they aren’t super common), I make it a point to watch it as I almost unanimously enjoy them. One recent heist series I am especially enjoying is Netflix’s Money Heist (aka La casa de papel), a Spanish show that had me enthralled when I watched it late last year. I figured with how much I enjoyed that show, I might as well give a Swedish heist series called The Simple Heist a chance as well. I knew it would likely be much simpler and more cheaply made than Money Heist but I am always willing to give foreign shows a chance since I have found so many gems overseas (The Detectorists, Humans, and more). The Simple Heist is no Money Heist, but it is still a very serviceable comedy/drama that is a very quick and easy binge. The Simple Heist (also known as Enkelstöten) is a Swedish comedy/drama about two old ladies who, due to financial problems beyond their control, decide to rob a bank. Jenny (Lotta Tejle) is a high school teacher who is currently in the middle of a divorce from her husband Gunnar, who had a prenup that gives her nothing (the divorce was caused by her cheating on him with a younger man). Her friend Cecilia (Sissela Kyle) is a doctor who lost a lot of money in the Chinese stock market. When one of Cecilia’s dying patients reveals that he had the perfect bank robbery planned for a few days from his expected death date, he decides to convince her to pull it off as nobody would ever expect a grandmother. Cecilia is down for this plan almost immediately but she needs a partner and has to convince the much more reluctant Jenny to go through with it. The six episodes in the series deal with the robbery (which already happens in episode two) and the aftermath when things don’t go exactly as planned, as two novice criminals struggle to keep themselves away from the long arm of the law. As the series is from Sweden, the dialogue is in Swedish but subtitled in English. I only have two very minor complaints with The Simple Heist, the only problem is that I also don’t have a lot to applaud the series for either. It is just an average to slightly above average heist dramedy that doesn’t really do anything wrong, but doesn’t excel in much either. My two complaints are the following. First of all, I think the series made a mistake by having the “heist” (more of a robbery really) happen already in the second episode. The plan was already set up but they could have easily had some problems come up that forced some more preparation. Some of the content that happens afterwards is still compelling but the first two episodes are definitely the most entertaining and I think the series would have been helped with a further focus on the heist itself. The other minor problem I have with the series is the “simplicity” of it. Every problem that comes up is solved relatively easily and everything from the plan itself to the resolution to the story is quite simple. Of course this is a low budget Swedish series so they couldn’t stage a grand heist or anything like that but more complexity would have been nice for the series. Other than those two minor problems though, The Simple Heist is very watchable and a quick binge at just six episodes. The show is reasonably funny but I could definitely tell that some of the humor was lost in translation. Some things are really hard (if not impossible) to translate and comedy is one of the big ones. Still, the show is quite funny, especially Cecilia whose quick turn from boring grandma to stone cold criminal is very entertaining. Unfortunately, Jenny is far less entertaining and occasionally comes very close to being an irritating character (as she is constantly freaking out about every little thing). In small doses her freakouts can be fun but I feel like the show spent a bit too much time in this area. Watching the women have to do things like chat on a dark web forum and work with other criminals leads to some funny moments. Most of the rest of the humor is a bit more low key, especially the saga of Gunnar’s bridge table. I’m sure I missed a lot of the humor due to not being Swedish or having an understanding of the language though. Note that there are a surprising amount of F-bombs in this show. While I personally find it funny coming from two old women, if you don’t enjoy shows with a lot of swearing The Simple Heist might not be for you. The heist part of the show is important for the comedy in the series, but ultimately The Simple Heist: Series 1 is more of a drama about two older women experiencing a more exciting life in their golden years. The show does also deal a lot with Jenny and Cecilia’s relationships with their families (their husband or ex-husband and in the case of Jenny, her high school daughter Harriet). I wouldn’t call The Simple Heist a comedy, I would consider it to be more of a dramedy especially if you don’t speak Swedish (and thus can’t understand all of the jokes). While it doesn’t play into the show much, one thing to note is that this entire story takes place during the Christmas season and you can somewhat experience a Swedish Christmas and their customs by watching it. As a low budget foreign show, The Simple Heist: Series 1 was only released on DVD. The video quality is acceptable but far from great. As the budget for this series was noticeably quite limited, there isn’t really anything you need to see in pristine video quality anyway. The sets and other shooting locations are pretty basic, the heist isn’t really visually impressive, and most of the shots just involve the two women talking anyway. The audio is basically in the same boat but note that English viewers will have to read subtitles. Unfortunately no extras are included in the package. 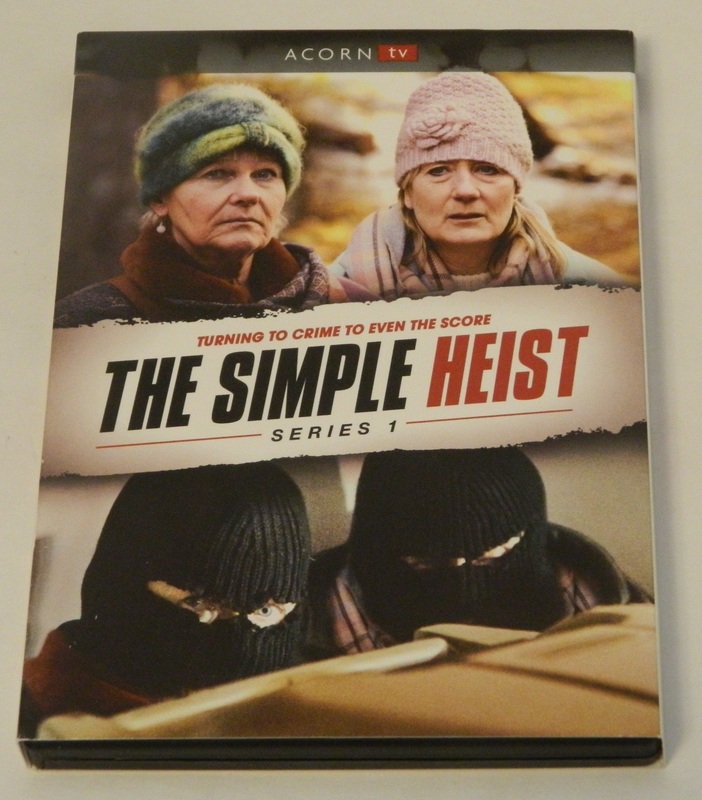 The Simple Heist: Series 1 was released on DVD on March 12, 2019. We would like to thank Acorn Media for the review copy of The Simple Heist: Series 1 used for this review. Other than receiving the review copy we at Geeky Hobbies received no other compensation. Receiving the review copy had no impact on the content of this review or the final score. Reasonably funny and entertaining to watch. The show is a solid mix of the comedy, drama, and heist genres. Some of the comedy is definitely lost in translation. The show (and especially the heist) is somewhat simplistic.